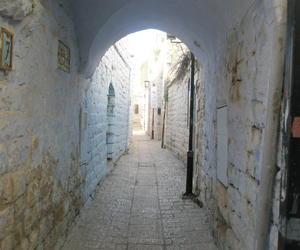 One of the more unusual tourist spots for men in Safed is the Ari Mikve which is located adjacent to the Old Cemetery and is accessible along a walkway direct from the Arizel's grave or just past the Sephardi Ari synagogue there is a stepped path leading down to the Mikve. Why Do Men Use A Mikve? According to the Written Torah, mikvot were used by men for spiritual purification in certain circumstances: before going up to the Temple to pray or offer sacrifices, before marriage, after having marital relations and as the final stage before conversion to Judaism. Nowadays the only time men are obligated by the Torah to use a mikve is to become Jewish. However, Hassidim often use a mikve on a daily basis, especially in Israel, where mikvot are freely available. Many men use a mikve regularly before Shabbat and the Festivals or after marital relations. Others consider it a prerequisite to at least use a mikve once a year as part of their spiritual preparations for Yom Kippur. What Is Special About The Ari Mikve? The Ari Mikve is formed by a natural spring or maayan, which is considered to be the most spiritually uplifting type of mikve. The Arizel, Isaac Luria, used to use it on a regular basis and many other tzaddikim (holy men) have used the mikve since then. It is said that anyone using this mikve is certain to do teshuva (repenting) before they die. Also, according to sources, the Ari's body was brought to the mikve for ritual purification by his students after he passed away. It is said that his body actually "toivilled" (dunked) itself in the water and then got out of the water and laid down and his students continued with the funeral rites. There have been various renovations over the years to the site. There is now a building built over the mikve providing minimal changing and toilet facilities. There are no showers or lockers and nowhere to put valuables, but there are hooks to hang clothes or towels. There is an unofficial attendant who rents towels, sells drinks, plays music and generally helps to keep the place tidy. However, as he is not there all the time it is advisable to bring your own towel. The pool itself is not big, about a 1.5 meter by 1.5 meter and about 1.20 meter deep, and it is in a cave. Therefore, it only holds 4 men at a time. The water is spring water and not heated so while it is "refreshing" in the summer and it can be "rather chilly" in the winter. Long meditative "dunks" are discouraged at busy times, i.e. before Shabbat, Rosh Chodesh and Festivals, the yortzite of the Ari, Lag B'Omer and vacation time as there is usually a queue to get in the water. As this is a spiritual activity it is not "proper" to stare at the other men waiting in the queue. It is also not considered modest for fathers and sons (over the age of 8) to go in together unless one or the other needs practical help. Due to the small size of the mikve, and the number of men using it day and night throughout the year, women are not usually able to use this mikve. Admission is free but there are plenty of tzedaka (charity) boxes where you can donate money if you want. The mikve is open 24 hours a day, 365 days a year.